What an altar is, how it really works, how to construct your own powerful altar (plus what to do with it once you have one). 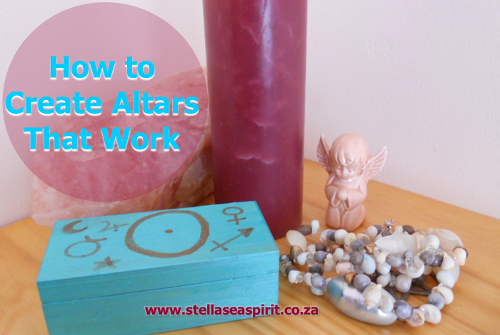 Building an altar doesn’t have to be time consuming or costly. You do not have to have pricey items from esoteric shops for your altar to function. When it comes to altar building it’s a lot more about technique than the actual objects. You can utilise things already in your possession, organic items you collect out in nature, gifts received from loved ones or browse local flea markets and garage sales for random magical items. You may notice that you create altars subconsciously like displaying reminders of things you value such as family photos and continuing family holiday décor traditions. In a practical sense your sport bag ready to go to the gym is an altar to your health and fitness. Your kitchen counter with the bowl of fruit on it is an altar to your nourishment and abundance. Your collection of crystals and faery figurines may be an altar to your dreams. > What Is An Altar? > How Do Altars Work? > What Do You Use An Altar For? > Why Place Specific Items On An Altar? > But What If I Live With People Who Think Altars Are Hippie-Voodoo-Nonsense? An altar is a dedicated space you use for personal sacred connection. It functions as a loophole beyond time and place that restores your presence from busy-ness and serves as a touchstone for checking in with your core and rejuvenating your spirit. To be clear, an altar need not only be used for ceremony, prayer or devotions. The place you use for blending oils, charging crystals or burning intention loaded candles may be referred to as your working altar. The kind of altar I am describing in this article can be constructed for use as a manifestation/creation, healing or cleansing grid (short or long-term). In my opinion, altars are like the perfect blend of a mini Japanese Zen garden and the in vogue vision board. Altars impart a sense of contemplation, charge the atmosphere, inspire and align energies to help you address a specific focus in your life you want to expand, bring balance to, or transform. Creating an altar is a way of facilitating a visible space that acts as a portal between dimensions, where you can flit between realities and morph into the version of self you wish to embody. When you first set out to deliberately create an altar you are wholly present in the action. In the stillness, your chattering mind calms down, there is no resistance to slotting the various pieces in place. Understand that magick doesn’t reside in your altar. It’s in the act of creating it that YOU set magick in motion. Proceeded by following up through taking actions you are inspired to take in the everyday realm. Your altar is making a clear statement (outside of your head in a visible form) about where you are headed and indicates the space you are allowing for the magick to unfold that will lead you there. A lot of the time you may think you are in alignment with your dreams because mentally you conceive a plan and perhaps accompany that with visualisation, affirmations or other manifesting techniques. Except these remain castles in the air, since you aren’t grounding them in the physical plane, here and now with observable actions. While creating your altar (no matter how simple or elaborate) you are fully present in the moment where all your power resides. This is when you communicate from who you really are and not from who you think you are. You connect with your source self, that innermost magical aspect that knows the timeless, formless energy of pure creative flow. In this way, your altar becomes a visual reminder of your commitment to bring what it is you are desiring into your life. It helps you align body, mind and soul. What Do You Use an Altar For? There are no limits to what you choose to use it for! Why Place Specific Items On An Altar? The reason for placing artefacts of each element on your altar, is to bring the matching energy of that element (or whatever deliberate connection you wish to make) into your space. They act as symbolic links and help you hold the space for the energies, making their arrival and stay more fluid while lending tangibility to their presence. For example, to connect with the energy of Venus you could use something made of copper. To connect with the energy of the moon you might select a piece of selenite. Similar to setting the table when you have invited guests over for dinner; you extend the invitation to the energies then welcome them in with elegant hospitality. You can have one altar covering all areas of your life ~ career, business, love, relationships, family and prosperity. Or you can create several altars each with one specific focus as your needs unfold. Items specific to the focus of the altar are placed as central objects. Why? Because the centre is where all four elements, the building blocks of all Creation, meet! You can place items such as; candles, figurines that hold meaning for you, containers or bowls that hold intention papers (or perhaps encompass the entire altar), shells, plants, flowers, seeds, incense, feathers, stones, crystals. Add images such as photographs, paintings or prints of archetypes, power animals or places and sacred geometric patterns like the flower of life. Add oracle or Tarot cards, Runes or sigils that are related to your chosen focus. For example clear quartz crystal for clarity or the sigil of Mars for protection. For example, your focus may be on effective harmonious communication in a relationship so you could incorporate Archangel Gabriel, the spirit of Libra, blue lace agate, rose quartz, chamomile, lavender and the Rune, Mannaz. Stand before your altar and imagine a beam of brilliant diamond-like light entering your crown chakra. Then either sense this stream of energy projecting from your heart or brow chakra over the altar or place your hands palms down over it (you may experience heat or tingling in your palms). Place a gratitude offering (food/drink/incense etc.) on it at full moon for 24 hours then remove and dispose of it as usual. The life force essence of the offering is taken up, not the actual ingredient. Moving altar pieces around as you feel called to symbolically rearranges patterns that cause subconscious shifts that display externally. It’s like plotting elements of charted territory on a map and leaving the universe to fill in the uncharted areas in your favour. Altars are also metaphors for your internal state so pay attention if your altar is cluttered, dust-covered or neglected versus a sparkly clear, super-charged deliberate powerhouse! Similar to solar-powered cells, your altar draws in energy, charges the circuit and consistently beams your intention into the warp and weft of Infinite Is, so ensure that you are tending it to keep it relevant. Give thanks to the elements and all beings that presided over it, supporting your intentions. Dismantle the altar and physically clean the items that can be while affirming that you are now neutralising your programming of them as you do so. But What If I Live With Non-Magical People Who Think Altars Are Hippie-Voodoo-Nonsense? This is an ideal snippet of sacred space that you can display on a windowsill, fireplace mantle, dressing table, kitchen nook or other open surface without causing too much interrogation from others about what you are up to.